Home / Equine Supplements / TRI-ACTA H.A. / TRI-ACTA H.A. *Equine-specific molecular weight formulation. Not intended for use in other species. 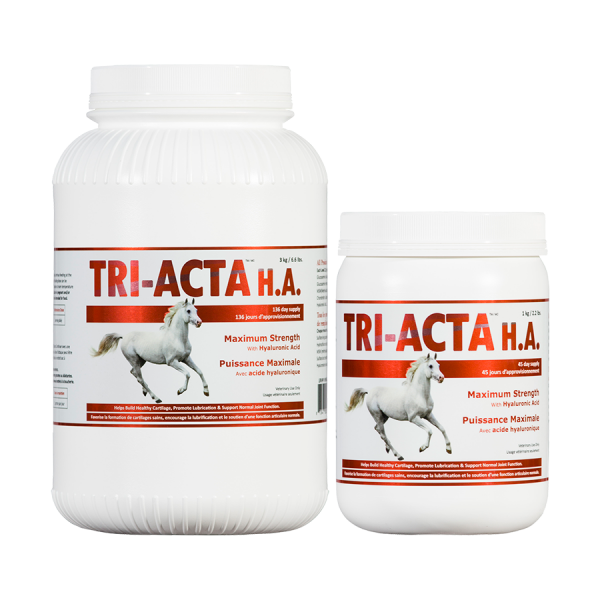 SKU: 601000 Categories: Equine Supplements, TRI-ACTA H.A. 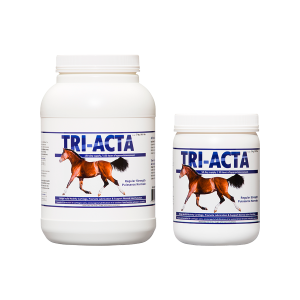 Built off the success and science-driven formula of TRI-ACTA Regular Strength, our Maximum Strength formula provides your horse with the added support of a highly therapeutic, equine-specific hyaluronic acid. TRI-ACTA H.A. contains the highest, all-active key ingredient formulation on the market. This formula uses two types of glucosamine for cartilage regeneration (glucosamine hydrochloride for bioavailability, and glucosamine sulfate to promote the formation of collagen). It also contains chondroitin sulphate – which works synergistically with glucosamine to prevent the breakdown of cartilage and MSM which is a powerful antioxidant and reduces inflammation. The inclusion of hyaluronic acid helps lubricate articulating joints, thereby minimizing friction and enhancing resistance to shock in weight-bearing joints. TRI-ACTA H.A. delivers unmatched quality, efficacy and therapeutic value. Because the product is pure and concentrated, the servings are small and easy to administer. Our 22g daily serving of TRI-ACTA H.A. provides your competitive equine partner with the optimal therapeutic dose of key, all-active ingredients necessary to promote and maintain optimal joint health while mitigating joint degeneration. Why is TRI-ACTA H.A. so effective? Integricare uses only pure, pharmaceutical grade ingredients sourced in Canada. Each component selected in TRI-ACTA products has been clinically trialled in numerous scientific studies for their effectiveness for joint health and mobility. Importantly, TRI-ACTA ingredients are formulated using species specific molecular weights. This means our formulas are developed to most closely resemble that of what the equine body produces naturally, making TRI-ACTA extremely bioavailable, therapeutic and effective. Additionally, with no fillers, synthetic additives or preservatives, TRI-ACTA products present no risk of adverse side effects or contraindications with medications. No fillers also means the servings are small, easy to administer, and provide value. Glucosamine hydrochloride: Glucosamine HCl is a highly bioavailable form of glucosamine. This means it is absorbs readily and is extremely efficient. This is attributed to the fact that it is naturally stable and does not require sodium chloride (an extra ion) to stabilize it. This means it is a slightly more pure form and effective in delivering glucosamine to the body. Hyaluronic acid is present in every cell of the body. The molecular weight of hyaluronic acid in the equine body is specific to the equidae family of animals. It is important that oral supplementation closely resembles the molecular structure of what is produced at the cellular level. Within the joint, hyaluronic acid works to increase the supply and viscosity of synovial fluid. A main precursor to joint degeneration and arthritis is a lack of synovial fluid to properly encapsulate and lubricate the joint. When the joint lacks proper lubrication, friction between cartilage and bone occurs, leading to pain, inflammation and decreased resistance to compressive forces. By supplementing daily with hyaluronic acid, the synovial fluid within the joint capsule is replenished. As a result, the joint structure remains lubricated promoting fluidity of movement and optimal performance.